Osmium was first isolated in the form of osmium tetroxide, OsO4, and was in fact named from the Greek osme, meaning “a smell”, due to the intense odor of this compound. This compound forms spontaneously when pure osmium metal is in contact with air, and is both volatile and extremely toxic, and thus the pure metal is rarely used. Osmium is, however, the most dense naturally occurring element and imparts hardness when used in metal alloys. Hard osmium-containing alloys are used in many contexts where resistance to wear due to friction or frequent operation is desirable; this includes use in the tips of fountain pens, instrument pivots, and electrical contacts. Despite its extreme toxicity, osmium tetroxide is the most frequently used osmium compound. It is valuable in the life sciences for staining and fixing biological tissue for electron microscopy, where it provides contrast that would otherwise be lacking when imaging substances made primarily of carbon. Additionally, it is used as a lipid stain in light microscopy and in some cases for fingerprint detection. Osmium tetroxide is also valued as a chemical catalyst in Sharpless asymmetric dihydroxylation, a reaction for which Karl Barry Sharpless won the Nobel Prize in Chemistry in 2001. The expense of the compound limits its use for this purpose to some degree, but it is considered a far superior catalyst for this process compared to the alternative, KMnO4. Finally, organometallic complexes containing osmium are under investigation for potential use in cancer treatment. Like other platinum group metals, osmium is typically obtained for commercial use as a byproduct of nickel and copper mining and processing, but can also be obtained from ores rich in platinum and from alluvial deposits. Osmium metal is almost entirely used to produce very hard alloys with other metals of the platinum group. Osmium tetroxide has recently been used to detect fingerprints and as an aid to stain biological samples in preparation for microscopy studies. Osmium is available as metal and compounds with purities from 99% to 99.999% (ACS grade to ultra-high purity). Elemental or metallic forms include pellets, rod, wire and granules for evaporation source material purposes.Osmium nanoparticles and nanopowders are also available. Oxides are available in powder and dense pellet form for such uses as optical coating and thin film applications. Oxides tend to be insoluble. Fluorides are another insoluble form for uses in which oxygen is undesirable such as metallurgy, chemical and physical vapor deposition and in some optical coatings. Osmium is also available in soluble forms including chlorides, nitrates and acetates. These compounds can be manufactured as solutions at specified stoichiometries. Osmium is a Block D, Group 8, Period 6 element. The number of electrons in each of osmium's shells is 2, 8, 18, 32, 14, 2 and its electron configuration is [Xe] 4f14 5d6 6s2. 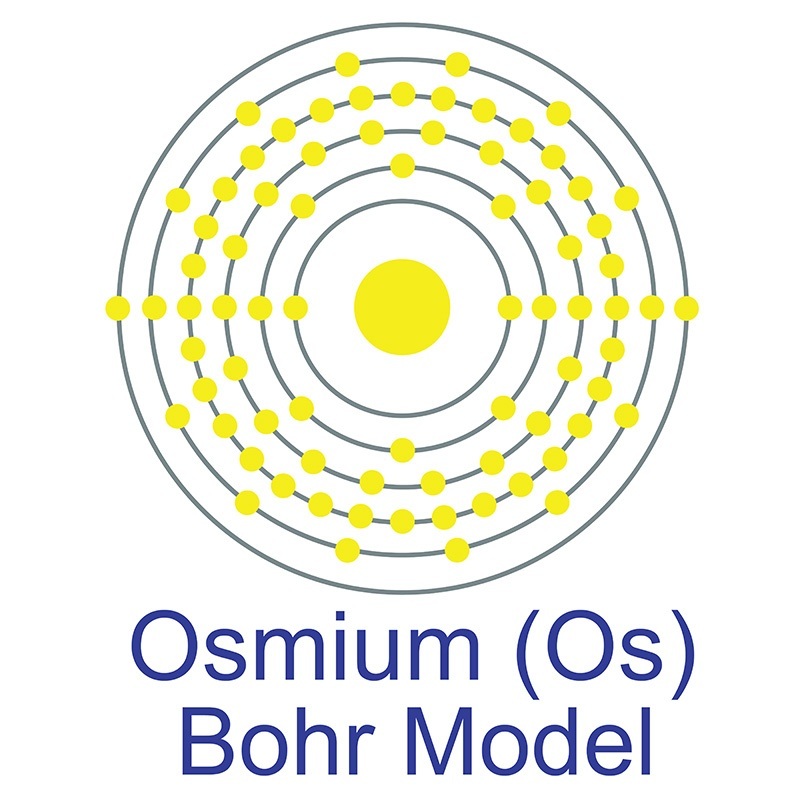 The osmium atom has a radius of 133.8.pm and its Van der Waals radius is 216.pm. In its elemental form, CAS 7440-04-2, Osmium has a silvery blue cast apperance.Osmium has the highest melting point and the lowest vapor pressure of any of the platinum group of metals. Osmium is the least abundant stable element in the earth's crust and is the densest stable element. It is found in the alloys osmiridium and iridiosmium and as an uncombined element. Osmium was first discovered by Smithson Tennant in 1803. The origin of the name Osmium comes from the Greek word osme meaning a smell or odor. Osmium is extremely volatile and toxic in its oxide state. Safety data for Osmium and its compounds can vary widely depending on the form. For potential hazard information, toxicity, and road, sea and air transportation limitations, such as DOT Hazard Class, DOT Number, EU Number, NFPA Health rating and RTECS Class, please see the specific material or compound referenced in the Products tab. The below information applies to elemental (metallic) Osmium. face velocity of at least 100 feet per minute. Segregation coefficient (n-octonol/water): Not determined. Osmium powder forms toxic osmium tetroxide when exposed to air. REACH - Pre-registered substances Substance is listed.